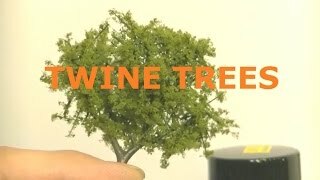 Trying to make more realistic trees for the layout. I read an article where a guy was using twine on dry flower heads, so I thought about using the tree armatures made by Woodland scenic. the first tree came out real good so I have been making more of them now. 1/4 to 1/2 inch lengths of twine work out good but larger trees may need longer. Rope works good too. Just bend the armatures up more to the middle to prevent gaps in the center.